Large steel structures have a lot of surface area open to attack. Only several layers of an anti-corrosion coating can ensure that steel bridges fulfill their purpose and pay off in the long run. Covestro has developed a pioneering solution that offers a number of advantages: Pasquick technology makes corrosion protection cheaper and less time-consuming than conventional processes, while delivering results that are just as long-lasting and high in quality, the company claims. One reason is because it reduces the number of coats required. However, Pasquick also benefits municipal bridge maintenance offices: reducing the number of coating steps can save on labour costs, which in turn reduces the overall cost of the coating process. Furthermore, structures can return to service sooner. Anti-corrosion coatings based on polyaspartic raw materials fulfill the requirements of ISO 12944 and have a low solvent content. They are efficient and recommended by leading coating manufacturers. Even various industry standards are now moving in this direction. One recent example is the coating of a new swing bridge over Lotse Canal in Hamburg-Harburg, Germany. 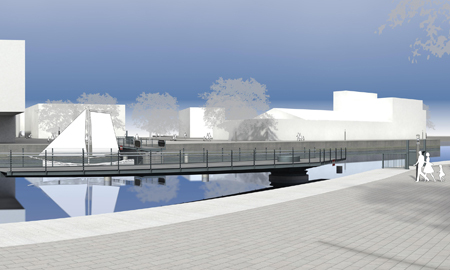 Soon to go into service, the pedestrian and bicycle bridge will improve the link between Harburg Castle island and downtown Harburg. The state's Department of Transportation responsible for roads, bridges and waterways, decided in favour of an anti-corrosion coating based on Pasquick technology. After the primer and intermediate coat, a topcoat from Dresden-based coatings producer novatic was applied. The company reported that it cured four times faster than conventional systems. Subsequent work on the 45m-long bridge was able to be completed sooner, and productivity was increased considerably. Another advantage of Pasquick is the very low VOC content of the coatings, which significantly reduces solvent emissions.